Tuesday November 26th 1889 Will went up north of town this morning after some cattle he had bought of Uncle Jim. I helped with the ironing. Mother went to town in the afternoon. I did some knitting. Will and I pasted books in the evening. 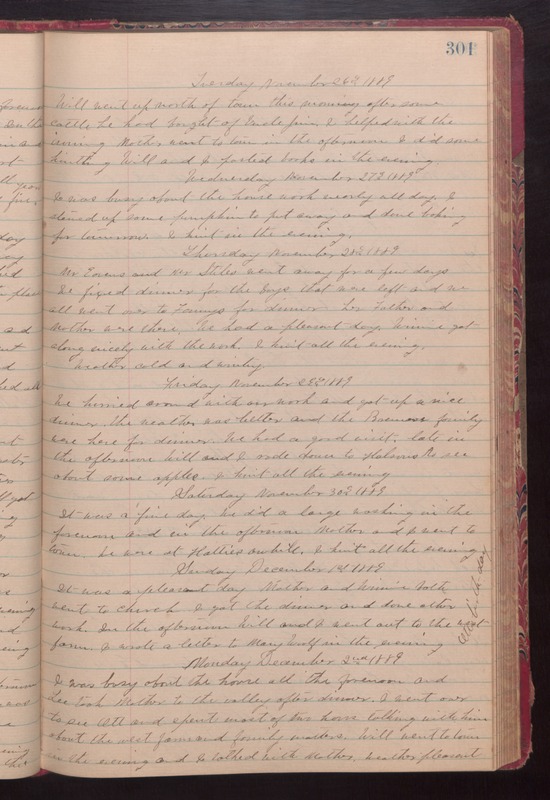 Wednesday November 27th 1889 I was busy about the house work nearly all day. I stewed up some pumpkin to put away and done baking for tomorrow. I knit in the evening. Thursday November 28th 1889 Mr Evans and Mr Stiles went away for a few days. We fixed dinner for the boys that were left and we all went over to Fannys for dinner. her Father and Mother are there. We had a pleasant day. Winnie got along nicely with the work. I knit all the evening. weather cold and wintry. Friday November 29th 1889 We hurried around with our work and got up a nice dinner. the weather was better and the Bremmer family were here for dinner. We had a good visit late in the afternoon Will and I rode down to Holsons to see about some apples. I knit all the evening. Saturday November 30th 1889 It was a fine day. We did a large washing in the forenoon and in the afternoon Mother and I went to town. We were at Hatties awhile. I knit all the evening. Sunday December 1st 1889 It was pleasant day. Mother and Winnie both went to church. I got the dinner and done other work. In the afternoon Will and I went out to the west farm. I wrote a letter to Mary Woolf in the evening. Otts birthday. Monday December 2nd 1889 I was busy about the house all the forenoon and Lee took Mother to the valley after dinner. I went over to see Ott and spent most of two hours talking with him about the west farm and family matters. Will went to town in the evening and I talked with Mother. weather pleasant.